Pfizer has added to a run of new product approvals for acute myeloid leukaemia (AML) with an FDA nod for Daurismo, the first smoothened (SMO) receptor inhibitor to be approved for blood cancer. The US regulator cleared Daurismo (glasdegib) for use in combination with low-dose cytarabine for patients with newly-diagnosed AML – aged 75 or over – who are too frail to be treated with intensive chemotherapy. And in a bumper day for the therapeutic category, the FDA also approved AbbVie and Roche’s Venclexta (venetoclax) with cytarabine or a hypomethyelating agent (azacitidine or decitabine) for the exact same indication – adding the options for this patient population and taking the total number of new drugs for AML in the last couple of years to seven, after decades of stagnation. “Intensive chemotherapy is usually used to control AML, but many adults with AML are unable to have intensive chemotherapy because of its toxicities,” said Richard Pazdur, acting director of the FDA’s Office of Haematology and Oncology Products. The new approvals give oncologists additional tools to use in “the treatment of AML patients with various, unique needs,” he added. Phase 2 data submitted in support of the Daurismo marketing application show that combining Daurismo with cytarabine reduced the risk of death by 54% compared to cytarabine alone in these patients. The small-molecule drug blocks part of the Sonic hedgehog pathway, which is also targeted by other cancer drugs including Roche’s Erivedge (vismodegib) and Novartis’ Odomzo (sonidegib) for basal cell carcinoma, a smaller patient population than AML. Analysts at Credit Suisse have previously predicted that approval in AML could make glasdegib a $450m product by 2020, with an additional upside if Pfizer can also get approvals in other indications such as myelodysplastic syndrome (MDS), acute lymphoblastic leukaemia (ALL), chronic myeloid leukaemia (CML) and solid tumours. At the moment Pfizer looks to have a solid lead over its SMO inhibitor rivals. Erivedge has been discontinued for AML and other blood cancers, but remains in mid-stage development for solid tumours including beast, gastric, pancreatic and lung cancer, according to Adis Insight, which says Odomzo is in phase 2 trials for both solid tumours and blood cancers. 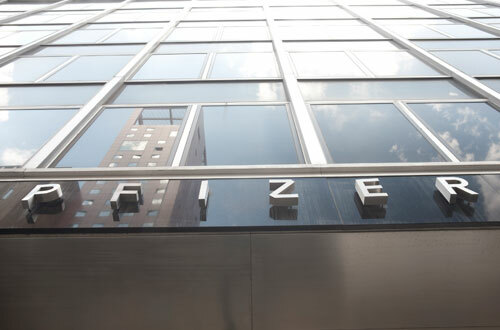 For Pfizer, the Daurismo is the fourth new cancer approval in the last couple of months, coming just a few days after it got the go-ahead for Lorbrena (lorlatinib) for metastatic non-small cell lung cancer (NSCLC), and a few weeks after the FDA backed PARP inhibitor Talzenna (talazoparib) for advanced breast cancer and EGFR blocker Vizimpro (dacomitinib) for first-line NSCLC. Meanwhile, Venclexta’s latest approval adds to the growing momentum behind AbbVie and Roche’s BCL-2 inhibitor, which has also been filed for approval for previously-untreated AML patients who are ineligible for intensive chemotherapy, to goalong with its existing indications in chronic lymphocytic leukaemia (CLL). EvaluatePharma has predicted it could become a near-$2.5bn product by 2024, providing it can also pick up approvals in AML and other indications like multiple myeloma.